Alison Shaffer: Purex's new Chocolate Chip Cookie Scented Laundry Detergent is available today! Purex's new Chocolate Chip Cookie Scented Laundry Detergent is available today! Have you heard about Purex's new Chocolate Chip Cookie Scented Laundry Detergent? The same great quality we know from Purex, now with a brand new scent. Imagine sleeping on a pillow case washed in this new laundry detergent from Purex. All night while you sleep you can smell chocolate chip cookies in your bed. You might not want to get out of bed in the morning. It may even be hard to wake the kids up for school. 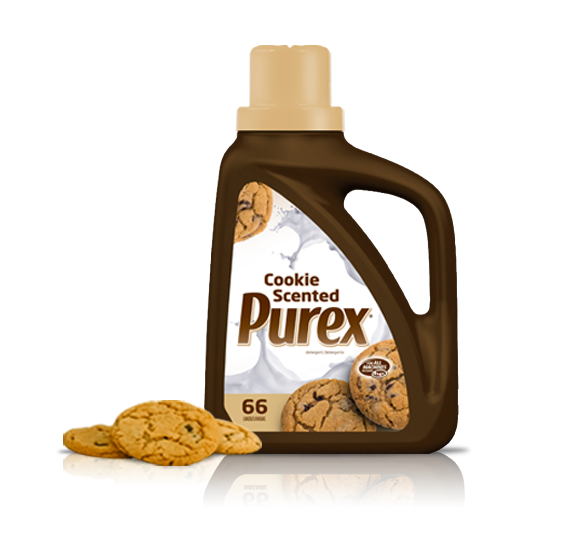 Don't worry you can use new Purex on all you laundry and get the scent of chocolate chip cookies to smell all day long. Use it to wash your bath towels and you'll be smelling like a chocolate chip cookie instead of soap. Use it to wash your work clothes and your co workers are gonna wonder why you smell so good. They will be talking to each other about you smelling like a bakery. Start the new month of April off with cookie scented Purex Laundry detergent and you'll be smiling all month long. This product is not for baking or cooking, it is for laundry use only. Disclosure: this information provide by Purex Insiders. No compensation took place. the comments and views are my own. Love this!!! Happy April Fool's Day! Great post!